I knew the 21st century had arrived in Fiji’s Yasawa Islands when the pig farmer guiding me on a mountain walk stopped to photograph the view with his phone. He wanted a picture to post on his girlfriend’s Facebook page, he explained. It wasn’t what I’d expected from a villager on an island where electricity is still a novelty and where many people survive on root crops grown in bush clearings. The truth is, however, the modern world didn’t suddenly arrive in the Yasawas when my pig farmer got a smartphone. It arrived exactly 12 years earlier. 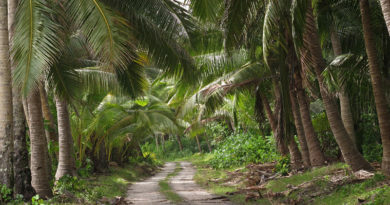 The Yasawas, an arc of 20 or so sparsely populated islands northwest of Viti Levu, Fiji’s main island, were hard to get to and largely undeveloped until the early 2000s. A fresh batch of holiday-makers arrives at Octopus Resort. The only accommodation options were a few backpacker lodges, served by uncomfortable and risky fishing boats from the mainland, and an even smaller number of top-end resorts. 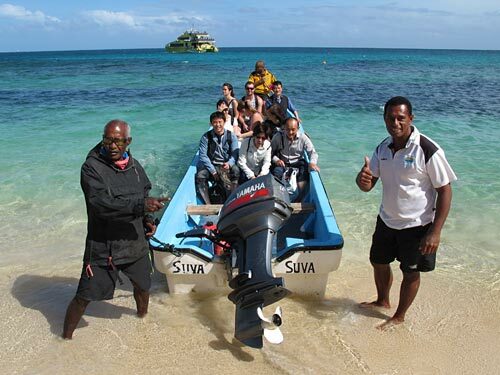 Tourism focussed on the more accessible Mamanuca Islands, a short hop from Nadi by boat. In 2002 a New Zealand-based duo started a daily ferry service linking Nadi’s Port Denarau with the Yasawas, leading to an explosion in the number and variety of resorts on the islands. There are now about 25 resorts scattered across 13 islands, ranging from backpacker beach hangouts to a private islet for the rich and famous. Many are owned by Kiwis and Australians, others are owned by villages or local families. Some are slightly ramshackle, others are as slickly organised as a Swiss business convention. A few announce their party resort status with thumping basslines from beach bar speakers but most are very, very mellow. 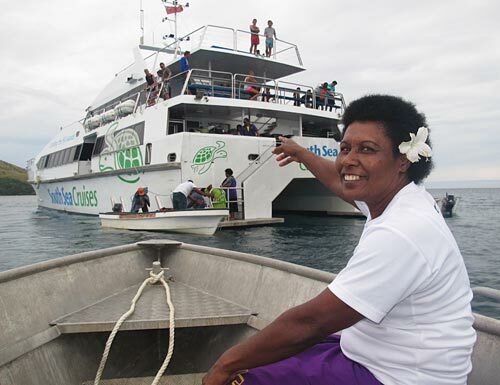 Every morning the 35-metre catamaran Yasawa Flyer leaves Denarau, calling in at each island in turn and taking about five hours to reach its northernmost stop. Every afternoon it heads back again, arriving at Denarau around 6pm. If, like me, you find the idea of lying on the same beach for a week almost as appealing as spending your holiday at the dentist’s, the ferry is a boon. It means you can spend a few days or a few weeks hopping through the islands, experiencing different resorts and activities along the way. Part of the attraction of island-hopping is the ferry itself, which offers a chance to meet fellow travellers, see the islands slip by, and watch the organised chaos as water taxis jostle to load and off-load supplies, luggage and passengers at every stop. The first of many musical welcomes at Octopus Resort. Occasionally wildlife puts in an appearance too. Just as we neared the first of the Yasawas a trio of dolphins leapt in unison on one side of the bow and then the other before vanishing. It was so perfectly timed I suspected Fiji’s tourism board had a hand in it. My first stop was Octopus Resort on ruggedly volcanic Waya Island, where our welcome was to become a familiar ritual. A dozen resort staff clad in bright colours were waiting on a picture-postcard beach with guitars and ukuleles, singing a song of welcome as we beached among the breakers. After being helped out of the boat we shook hands with every member of the welcoming party, each offering a cheery “bula!” and a 500 kilowatt Fijian smile. We were given a glass of juice and, after a briefing on meal times and activities, ushered to our rooms. Each arrival makes you feel like visiting royalty or the first guest in months. In fact, I was usually sharing a water taxi with a bunch of cash-strapped backpackers, and most resorts get a boatload of fresh guests every day. 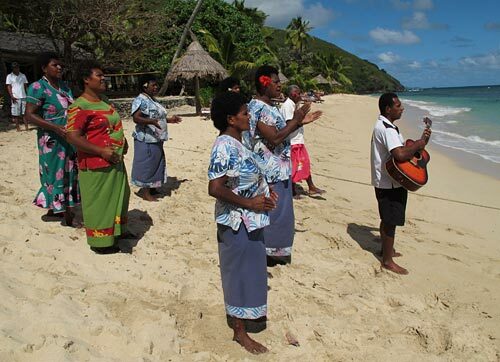 Making them all feel supremely welcome is one of those traits that make the Fijians so good at tourism. I spent most of my time at Octopus snorkelling, trekking volcanic peaks with the pig farmer, and sitting up late chewing the fat with other travellers, first over bowls of yaqona – known elsewhere in the Pacific as kava – and later over Fiji Bitter. I also ate an incredible amount. The philosophy of co-owner Dave Good, originally from Whakatane, is simple: Give the guests fine food. And plenty of it. I won’t even start to list what I ate. Most of it involved freshly caught fish, battered, grilled or raw, marinated in bush lemon and coconut milk in the classic dish kokoda. All of it was superb. One night a week guests are served a-la-carte in the sand-floored restaurant; the other nights feature themed buffets at long tables, designed to force visitors to mix. The beach at Botaira Resort, Naviti Island. Like most resorts in the Yasawas, guests at Octopus sign up to a compulsory meal package. That means backpackers eat as well as the well-heeled guests in the fancy beachfront bures (traditional, thatch-roofed accommodation). It was a novelty I certainly enjoyed. Another novelty was seeing the owner spend all evening with the guests, explaining how he had ended up in the Yasawas and the resort’s symbiotic relationship with the nearby village. The aptly named Mr Good also shouted our beers all night, and I’m pretty sure he was the last to go to bed. My next stop, about 45 minutes further north by ferry, was Botaira Beach Resort on Naviti Island. With just 11 bures this Fijian-owned resort caters to couples and families rather than backpackers. The only other people staying were a Gold Coast couple and a family fleeing winter in Hawke’s Bay. It’s the kind of place you could easily spend several days dozing in a beach hammock a few steps from your bure, but that would be a shame because Botaira has the best reef I snorkelled in the Yasawas. Several hundred metres long, protected by a village tabu (similar to a rahui in New Zealand) and just a few flipper-kicks from the beach, it’s a giddy kaleidoscope of colour. striped sergeant majors, close enough to bump into my mask; and my favourites, the parrot fish, wearing garish combinations of purple, blue and orange. Billy (or is it Ili?) with our stupendous catch. There were all sorts of other crazily coloured creatures I can find neither names nor rational explanations for. It was like gatecrashing an underwater fancy dress party. Later, resort boat drivers Billy and Ili took me on a fishing trip to a more distant reef. Fortunately for Fiji’s marine life I am possibly New Zealand’s worst fisherman, especially when armed only with a handline. The fish were not greatly threatened by Billy and Ili either, although Ili did manage to hook a couple of “sweet lips” just big enough for the frypan. The real point, perhaps, was to sit bobbing in a boat, soaking up the scenery and bonding with a couple of laid-back locals. My next stops were Barefoot Island Resort, a good base for snorkelling with manta rays, gentle giants related to the stingray but measuring more than four metres across; and Manta Ray Resort, on tiny Nanuya Balavu Island, where I’d been booked in for a Sunset Tube Cruise. I had visions of reclining on a boat’s deck, cocktail in hand, as sun slipped below the horizon. Reality was somewhat different, but possibly more enjoyable. About an hour before sunset I was ushered onto a dive boat with about a dozen backpackers and a chilly bin packed with ice and beer. When a second boat flashed past, stacked high with inflated inner tubes, it dawned on me what kind of tube cruise it was going to be. The sunset “tube cruise” at Manta Ray Resort. Once we were a few hundred metres off the sunset side of the island we were each handed a tyre tube and a can of beer and invited to jump in. Then there was little to do but drift, trade travel stories, try to tip each other out, and watch the sunset. It was rather silly but unexpectedly entertaining. My final hop took me to Coralview Resort on Tavewa Island, at the northern limit of the ferry’s run up the Yasawas. The resort was underwhelming at first – it managed to look tired and unfinished at the same time, with a beach prone to disappearing at high tide and an ugly rubble breakwater – but I soon warmed to the place, thanks to its low-key friendliness and commitment to giving guests a genuinely Fijian experience. Manager Niko Bruce, who owes his surname to a Scotsman who settled on Tavewa four generations ago, said the family-owned resort opened in 1992, making it one of the first in the Yasawas. 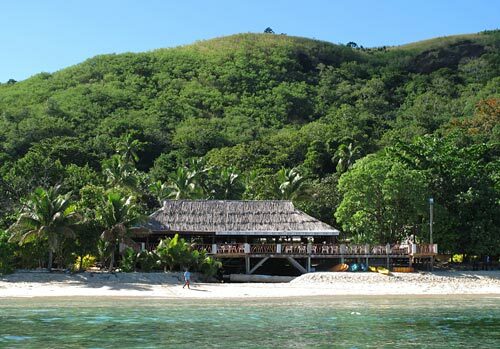 Like many Fijian-owned resorts, it made up for organisational shortcomings with authenticity, he said. “Visitors get plenty of beaches, snorkelling and diving, but they don’t always get a lot of Fijian culture. We try to make up for that,” he said. Over the next 48 hours Coralview staff set out to prove him right. First I watched the Bruce cousins sweat as they laid down a lovo in a fiery rock-lined pit, like a hangi in New Zealand, but with a piglet wrapped in a basket of pandanus leaves piled with taro, cassava, chicken and taro leaves soaked in coconut cream. I’m not the world’s greatest hangi fan but the Bruce boys’ lovo had me going back for thirds. The following evening the entire staff formed a choir and sang Sunday hymns while we ate. I have yet to meet a Fijian who did not sing beautifully. Time constraints meant I missed out on one of Coralview’s trademark excursions, snorkelling with sharks, but I did go swimming at the famous Blue Lagoon and took a trip to Sawa-i-Lau Caves, where I confronted a few phobias head-on by swimming through a underwater passage linking two caves in a limestone island. The experience of swimming in the pitch-dark centre of an island more than made up for the fear. The Yasawas are still at that happy stage where the islands have been opened up to tourism long enough to offer a wide range of accommodation and activities, but short enough to still feel unspoiled. Add good transport, fine food, Fijians’ natural hospitality and a splash of adventure, and you have a recipe for a great winter holiday. This is far from a definitive list. I had time only to visit six resorts out of 23. Do some research, talk to other travellers, and check out TripAdvisor. A party resort one night may be quiet the next, depending on the crowd. Botaira Beach Resort. A vibrant reef, protected by a tabu (a customary fishing ban), stretches hundreds of metres directly in front of the resort. If you get the tide right, incredible coral and fishlife is just a few kicks from the sheltered beach. Botaira isn’t a budget option but can be visited on a day trip from Denarau. Octopus Resort. Also offers a cooking course. Barefoot Island Resort, where you can join volunteer programmes helping village kids learn to read, improving rainwater supplies, or protecting reefs. It will cost you at least as much as a normal resort stay, however. Octopus has a fund to help the neighbouring village and will triple every donation you make. Botaira’s beach is lovely and near deserted; Barefoot has three facing different directions, one for every time of day. The beaches at Blue Lagoon and Nanuya Island resorts also get good reviews. 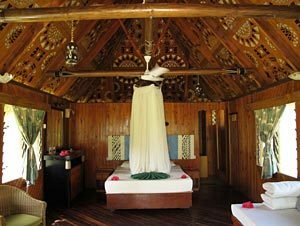 Inside a bure at Botaira Beach Resort. Botaira. These 11 bures aren’t new but are spacious and steps away from the beach, with lovely detailing and traditional motifs painted on the ceiling. The huge manta rays that cruise a channel next to Barefoot. The locally-owned Coralview Resort isn’t the flashest but staff put in a big effort to make sure guests get a taste of Fijian culture. That includes a weekly lovo (food cooked in an earth oven), culture nights and hymns on Sunday. Manta Ray Resort was the liveliest when I visited, though Coralview had the cheapest beer. The sunset tube cruise at Manta Ray Resort. Snorkelling with sharks or, for the claustrophobic, swimming through Sawa-i-Lau Caves (both available at Coralview). The 35m catamaran Yasawa Flyer leaves Port Denarau every morning at 8.30am and returns about 6pm. The operator, Awesome Adventures Fiji, offers a free pick-up from anywhere in Nadi. Otherwise the port is a short bus or taxi ride from town or the airport. If you’re visiting more than one or two resorts independently it may pay to buy a Bula Pass, which allows you unlimited hops between resorts for the time specified (many resorts, however, have a minimum two-night stay policy). The 2014 prices ranged from F$377 (about NZ$264) for a five-day Bula Pass to F$852 (NZ$596) for 21 days. An island-hopper works on her tan at Octopus Resort. 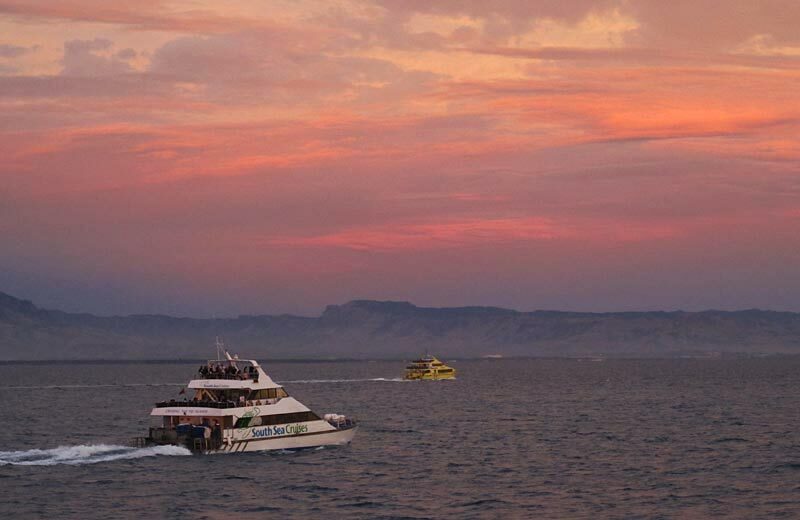 Because there’s just one boat a day and many resorts have limited space, it’s a good idea to book ahead, especially at the more popular spots. You can book directly with the resorts by email or website, at the port, or even at the travel desk on board the ferry. Awesome Adventures also offers a Bula Combo Pass combining a ferry pass and a choice of resorts. It comes in two grades, one-coconut or two-coconut, depending on your price bracket. 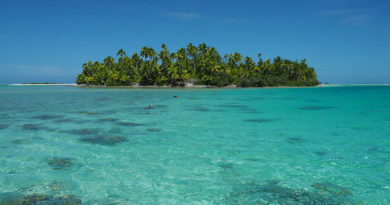 A one-coconut Bula Combo Pass for five days/four nights with dorm accommodation costs F$797 (NZ$558). The price climbs to the 21-day two-coconut pass with double/twin accommodation for F$3712 (NZ$2598). The company also offers a range of pre-organised island-hopping itineraries from four to 11 nights, which still offer a choice of resort most nights, depending on the price bracket chosen (one, two or three coconuts). 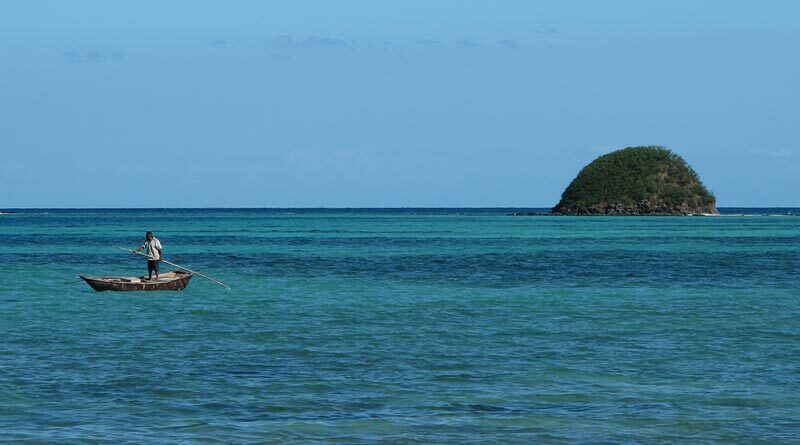 The cheapest is F$730 (NZ$511) for four nights/two islands in dorm accommodation. A Full Monty Pass throws in activities as well. Note that these are all 2014 prices and assume an exchange rate of F$1 = NZ$0.70. Note also that there are no ATMs anywhere on the Yasawas. Resorts will take credit cards but I saw travellers miss out on activities because they had no cash to pay small-time operators, for example for the boat trips out to the famous Sawa-i-Lau Caves. Even if you pre-pay all your accommodation and food, cash is sill useful for drinks and snorkel hire. See www.vinakafiji.com.fj and www.fiji.travel for more information. 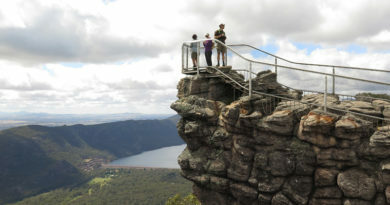 This story was first published in the Northern Advocate in July 2014 and was a runner-up in the Best Story about a Journey category of the 2015 Travcom Travel Writing Awards. 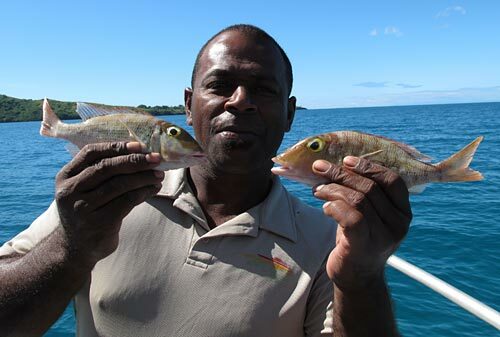 The author was a guest of Fiji Tourism and Awesome Adventures Fiji.